... 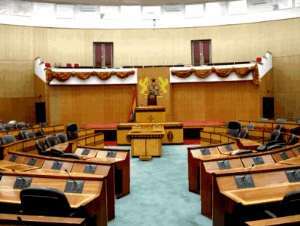 Cabinet to discuss $300 million loan The National Democratic Congress Member of Parliament for Upper West Akim, Hon Sallas Mensah, says the Minority would not have voted in favour of the passage of the $300 million CNT loan, if the lights had not gone off in Parliament House that night. Speaking on Peace FM on Wednesday, 12th May, 2004, the NDC MP who is also a Member of the Finance Committee in Parliament said, his colleagues rushed to vote in support of the loan agreement, when the lights were eventually restored According to him, the minority had, since day one, disagreed with the loan agreement. He noted that, during their emergency sitting, the minority relied on the due diligence conducted by the Ministry of Finance. Hon Sallas Mensah has therefore called for proper due diligence to be done on the loan agreement, to establish its credibility. However, Peace FM's intelligence has established that, cabinet will be discussing the $300 million agreement entered between the Ghana government and the Chinese New Techniques Construction (CNT) Investments Limited.